No where in the world is psych more potent, laden with eastern chords, and head nodding beats than in Turkey. Some of the most heavy and amazing psych has come from there. In the center of that musical scene there are a few musical heroes. 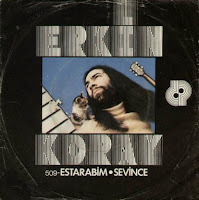 Erkin Koray is one of those heroes. Electrified and modernized for the sixties and seventies Turkish artists recorded with traditional instruments. Stringed instruments like the Oud and Sarod were amped and electrified and the Nagara and Goblet Drum provided percussion. Somehow eastern influenced psych found a home in Turkey and never left. I started developing interests in these eastern sounds when I caught a few episodes of the 'Namaste America' music videos. Mostly then it was Bollywood stuff. A few years later I shared my developing interests with my friend Bill. He was playing in the mid 90's with Turkish artists and making the trip there several times a year. I asked him to bring me the best record he could find. He brought me back this amazing 7 inch. That was it. I was all about the Turkish rock for some time after. Erkin Koray, Baris Manco, and 3 Hur-El to name a few. Their long hair, amazing electric sitar sound and Turkish language were all completely new to me. One of the great things about Turkish rock is I can't understand a lick of the lyrics. This somehow makes it better, not understanding, but imagining what ever you may. So, peep this 45 and delve into the world of Turkish rock. Hopefully it will work the same magic for you that it did for me.